Students looking for a dynamic off-campus experience that also allows them to engage in scientific research will have more options in 2017, thanks to a new agreement between Colgate University and the National University of Singapore (NUS). 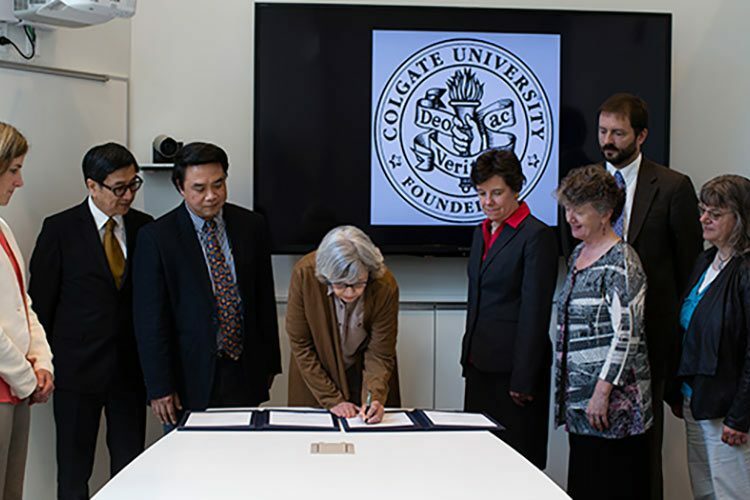 After more than a year of exploration and development, representatives of Colgate and the NUS signed a memorandum of understanding June 7, creating a new exchange program to benefit students from both institutions, and to act as a catalyst for future faculty collaboration. The agreement affords new research options for students in the departments of mathematics, computer science, biology, chemistry, and physics & astronomy. Jason Meyers, associate professor of biology, will lead the first group of Colgate students to Singapore in the fall of 2017, but unlike other full-semester study groups, Meyers will accompany students for just a few weeks before returning to campus in Hamilton, N.Y., to teach. In the spring, NUS students, already acquainted with students from Colgate, will then come to Hamilton, N.Y., to take courses, conduct research, and experience the liberal arts. Simpson said that, because NUS has existing relationships with Yale and Cornell universities, their faculty and administrators are already familiar with the liberal arts, and their curriculum has rigorous standards akin to Colgate’s. The new partnership was developed, in part, thanks to Ed ’62, P’10 and Robin Lampert P’10, whose generosity supported the founding of the Lampert Institute for Civic and Global Affairs at Colgate. The Lamperts have made a $2.5 million commitment to internationalization, and they also offered to match additional gifts of $500,000 up to $2.5 million for international initiatives. NUS Professor Roger Tan, vice dean and faculty of science, education and special duties, said he hopes this new endeavor will create more opportunities for cooperation in the future between the two institutions of learning. Professor Damhnait McHugh, Colgate natural sciences and mathematics division director, said that when she visited NUS with Meyers, Simpson and four other faculty in the natural sciences on their fact-finding mission this past January, it became abundantly clear that the university had extensive support systems and a strong commitment to welcoming international students.